The Rockdale Boys have been performing with banjo player Robert Sutor for the past year. He’s a local legend and we are blessed to have him helping us make some great music. Of course his main gig is playing with his smokin' hot trio Borderline. Do yourself a favor and check them out if you get the chance. Debbie has released her solo CD project this past year to enthusiastic aclaim. The CD is called The Eyes of Yesteryear and features many of her own original creations. We like it so much we're doing a few of her new songs with the Rockdale Boys. Be sure to pick up a copy online or at one of our shows. We are all looking forward to performing again at the Rose Tree Park Summer Concert series in Delaware County. It’s one of the best places to relax with friends and hang out under the summer stars while listening to some great music. Check out the schedule page for dates and times. The Rockdale Boys have been playing together as a group since 2003. The genesis of the band took place when Mark Sutherland and Bob Alek, two long time residents of Rockdale, met at Mark's birthday celebration. Harry Gambrill was also present with a banjo on his knee. A jam session occurred (Mark's birthday wish) and all three felt a spiritual as well as a musical connection. Dan Hughs joined the band after a short parade of bass players, and added a fourth voice along with a solid sense of timing and tempo. To complete the band, veteran fiddle player Rick Shryock joined the musical line-up in the summer of 2007. His blazing fiddle, strong vocal and a fine sense of how bluegrass music should be played, transformed the sound into something truly inspired and not to be missed. After many years Dan moved out of the area and Debbie Durant joined the band on bass and vocals. 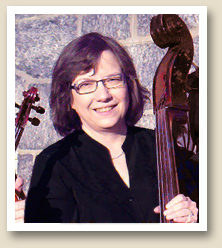 Another long-time bluegrass player, she is also a talented song writer and singer. The boys have mostly been performing for church benefits and at local festivals and events. The music is a mix of traditional Bluegrass, Gospel and some original compositions. For a more detailed picture of each band member, please scroll down to read a short biography. My Mama Prayed', 'Crossin' the Creek' and 'Ol' Rockdale' have become favorites with the boys and with their audience. Some of Mark's influences include the Beatles, The Allman Brothers, and Doyle Lawson. Along with his song writing skills, his ability to arrange the bands music, his fine vocal and harmony, and his encyclopedic knowledge of both traditional and gospel bluegrass, has made the Rockdale Boys a true musical force and inspiration in the area. are blessed to have her with us. Bob has been playing music from a very early age. Starting with the trumpet and the drums and later taking up the guitar, harmonica, flute and fiddle as well as singing lead vocal in several rock bands in the last century. His guitar playing has evolved from a jazz style to rock and then finally to bluegrass over the last 35 years. His lead vocal can be heard on many of their songs. The blend of Bob and Mark's harmony give the Rockdale Boys a unique sound not often heard in this type of music. folk music scene with swing band, The Casualaires. In the late 70's Rick played lead guitar and fiddle with Nashville songwriter, Dave Gibson. They recorded radio commercials and originals, and were the house band at Nashville North, opening shows for Alabama, Hank Williams, Jr, Buck Owens and Ferlin Husky. several other bands in the area.